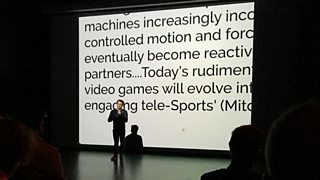 Professor Andy Miah, Chair in Science Communication & Future Media at the University of Salford, talked about Designing Virtual Sports at a Digital Cities Manchester event. The world of sport used to be simple enough: there were players and there were spectators or fans. Digital innovation is breaking down that distinction. According to Andy Miah, players and spectators are being brought into closer contact by technology. There’s now a kind of continuum between the couch potato and the sporting hero. One of the effects of this richer, multifaceted coverage – more cameras, more instant stats, more detailed analysis – is that viewers want to be able to choose exactly how they experience an event: ‘let me decide who I’ll watch, what I want to know, instead of the BBC choosing for me’. That kind of interactive experience pushes sports productions into new areas: towards the games makers and the VR pioneers. Andy said that it may not be long before US viewers of NFL will choose to watch through a Playstation, taking the business away from the TV networks and the cable operators. Wherever you look in sport, technology is offering new dimensions of experience and competition. In esports, screen games are played in front of real crowds in stadiums. But video game culture is crossing over into physical sports too. As Andy said, it seems strange to talk about the “gamification” of sport, but it does mean something. So, instead of just going for a run, you can turn your run into a game with an app called Zombies Run. If being chased by zombies doesn’t motivate you to get fit, nothing will. Similarly, if sitting on a cycle exercise machine doesn’t fire the imagination, and you don’t fancy kitting yourself up in Lycra, there are alternatives like Lesmill’s immersive studio, where you sweat up virtual hill and glide down virtual dale without leaving the air conditioned gym. What are the limiting factors on the revolution? Well, one is that however many cameras you have, video images of real events can never be as flexible and easy to work with as digital representations of those events. It’s the difference between a 360 degree video and a computer-generated VR equivalent. In the latter, the viewer can move, run around, interact, see everything from every angle and make choices that lead to different outcomes. Well, sports entrepreneurs are starting to break down that constraint on video and are already turning data from real sporting activity into a fully digital equivalent in real time. With multiple sensors on players and equipment, Virtually Live recreates a football game or car race in VR, allowing the spectator to be wherever they want – on or off the pitch or behind the wheel of a car. On the question of how long the digital sports revolution will take, Andy is cautious: he thinks that for the next few years, it’ll be the principle of “additionality” that will continue to drive developments: all the new stuff will sit alongside traditional coverage, rather than replacing it. On the other hand, here’s an interesting fact: the 2020 Olympics will be held in Tokyo. The Japanese love of gaming has already led to prime minister Shinzo Abe making a surprise appearance as Super Mario at the end of the Rio games. Who knows how much the Japanese will be able to merge their Olympics with video games? How much will be experienced not sitting back on the couch, but tensed up and participating over a smaller screen? Andy Miah is the author of a forthcoming book Sport 2.0: Transforming Sports for a Digital World. Digital Cities 2016, in which the BBC Academy is a partner, has run events in Manchester, Bristol and Birmingham.